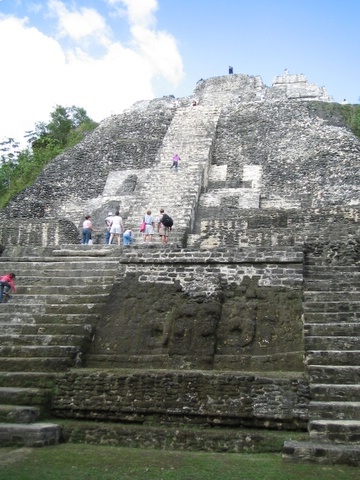 Take a Belize vacation, learn its history and perhaps never come back. 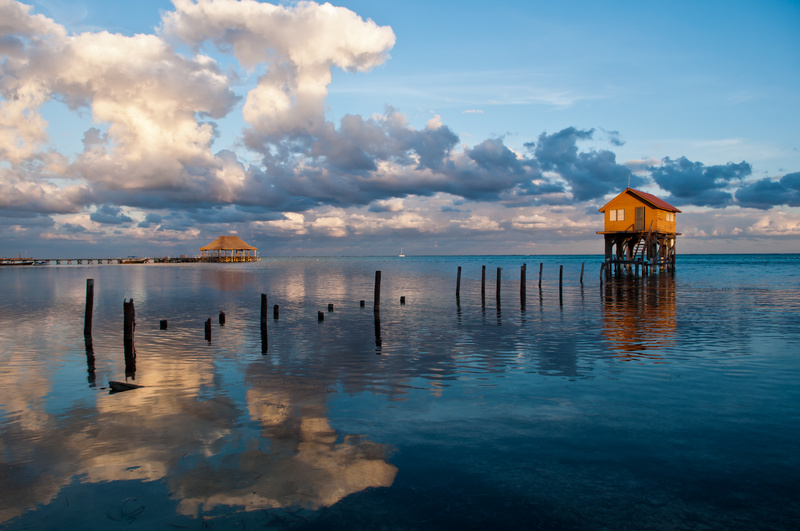 The lively country of Belize has long been luring travelers with its charming Caribbean-esque culture, exotic wildlife, and idyllic, turquoise waters. 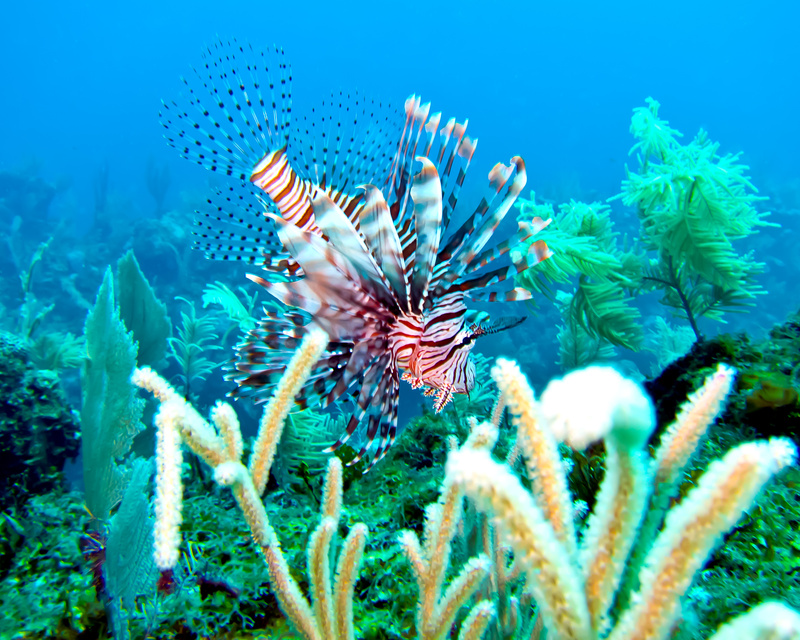 Bright corals and vibrant marine life inhabiting the surrounding sea attract snorkelers and divers of all ages, yet those who venture inland will also enjoy colorful wildlife as rainforests and lagoons appear within the country. Though Belize maintains enchanting coastal oases and opportunities for jungle adventure, the country’s true claim to fame may perhaps come from some of its earliest inhabitants: The Maya. Cities once filled with ancient Maya now welcome crowds of curious travelers who seek to unravel the mysteries of this legendary civilization. If you’re searching for a city with intriguing culture and history, sandy beaches, welcoming waters, a relaxed atmosphere, and rum cocktails that’ll knock your socks off, than maybe you should look into a Belize vacation. Major Plus: Belize’s official language is English, so traveling through this country is that much easier. 10 miles outside Belize’s international airport lay the country’s largest city, Belize City – your launch pad for all things Belize. The general starting point for tourists preparing to enjoy Belize’s famed draws – Maya ruins, snorkeling & diving opportunities, and jungle exploration – the city offers a great deal of transportation options to help you reach your destination. Frequently departing water taxis carry island-bound travelers from the city to San Pedro and Caye Caulker, while rental cars are available for those venturing inland to enjoy Belize’s ancient ruins & flora and fauna. 1.) Seaweed shakes – sounds gross but isn’t. They’re a yummy concoction of condensed milk, cinnamon, nutmeg, vanilla, and dried seaweed, blended with ice. If you’re of legal age (18+), try it with a shot of rum and enjoy! 2.) The Museum of Belize – a ton of knowledge regarding the history of Belize and the country’s current cultural sites. A great precursor to any Belize vacation is the Museum of Belize, located in Belize City. It’s a non time-consuming and inexpensive attraction – $5/adult, $2/student, and free for children – that offers useful information on the country. Previously used as a jail from the mid-1800s – 1992, the walls that house the collection are museum worthy unto themselves. Inside, exhibits shed light on Maya culture with ancient pottery and jewelry, and also provide background information on current travel destinations regarding this civilization. The logwood exhibit reveals the country’s economic roots in lumber, and the “Bottles of Belize” display features ink, medicinal, and alcoholic bottles dating from the 17th century – a subtle reminder of the country’s deep-seated appreciation for rum. For a convenient attraction showcasing intriguing artifacts and helpful travel information, it’s well the worth stop. Nestled among the tropical rainforest and thriving New River, the Lamanai ruins are a testament to Belize’s historic and cultural depth. The once Maya-inhabited city of Lamanai has become a point of interest for travelers seeking out the best of Belize, where ancient Maya mysteries reveal themselves through imposing temples – the Mask Temple, Jaguar Temple, and High Temple – and an iconic Maya ballcourt. Guests can climb over 100 ft. to the top of the High Temple and enjoy an awe-inspiring view of the surrounding rainforest and winding river, or simply admire the Mask and Jaguar Temples’ impressive artistry from a more grounded perspective. Adding another layer of sightseeing intrigue, the area’s exotic wildlife provides a rare opportunity for jungle adventure that shouldn’t be underestimated. Tours are generally half-day excursions, beginning with an over 20-mile wildlife cruise along New River – where exotic birds, turtles, and crocodiles line the banks. Ferries transport visitors from the nearby Orange Walk Town to the welcome center at Lamanai, where guests are greeted with colorful wildlife and the verdant jungle. Developed paths filled with howler monkeys and toucans follow guests through the rainforest to the Lamanai ruins, where Maya civilizations spanning 16th century BC to the 1600s CE took part in ceremonies and day to day life. Crystal-clear waters, flourishing marine life, pristine beaches and a friendly community – yep, you’re in San Pedro. San Pedro is an essential part of a Belize vacation. Settled on Ambergris Caye, San Pedro is the island’s only town and one of Belize’s premiere destinations. Overflowing with aquatic opportunities, this charming oasis boasts world-renowned diving and snorkeling sites, where colorful coral and tropical ocean life abound. Apart from the beautiful turquoise waters, San Pedro itself has much to offer with its refreshingly relaxed atmosphere and an island spirit. Residents and tourists can be seen humming through town on golf carts and strolling barefoot through the streets, enjoying the city’s casual eateries and local boutiques. Additionally, many pleasure seekers often unwind by enjoying the island’s fishing, golfing, and watersport activities. If you’re looking to vacation in Belize in style (perhaps on honeymoon), then I recommend the El Secreto resort. It’s absolutely breathtaking. You get your own private bungalow – complete with a jacuzzi, and indoor and outdoor showers. While shooting the Belize episode, the crew got to stay here, and we almost didn’t leave. The food was fresh and tasty, the staff- top notch, the bed – heavenly. It’s an amazing couples experience for anyone to escape to. Ambergris Caye is filled with fun things to do , especially for those who love the water. Among the island’s many diving and snorkeling activities , touring the Great Blue Hole is probably the most sought-after nautical excursion. An oceanic anomaly, the Great Blue Hole beckons divers far and wide to explore its clear, warm waters. A multitude of aquatic treasures emerge as one makes their descent through this sinkhole, from tropical fish and sharks near the surface of the dive to eerie Ice Age-formed stalagmites and stalactites around depths of 130 ft. Exploring the Great Blue Hole can be dangerous for novice divers, and even with a guide present, it’s suggested that one be well-versed in diving before embarking on this trip. 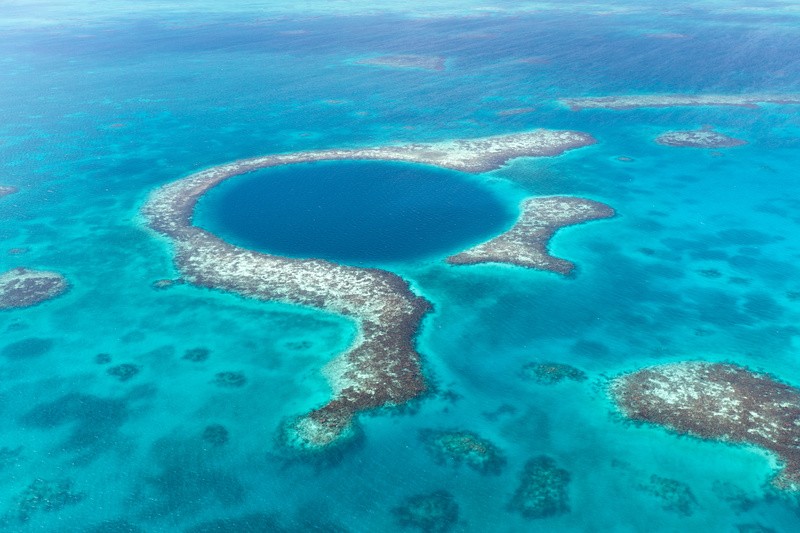 Tours of the Great Blue Hole entail a 130 ft. descent with 10 minutes of “bottom time” for exploration, 30 minutes being the total length of time in the water. Many of the touring packages feature a dive in the Great Blue Hole as one part of a day-long diving tour, where trips to other reefs and wildlife observation areas are included. The dives at Half Moon Caye Wall and Long Caye Wall – a.k.a. “The Aquarium” – are generally the trips where you can admire Belize’s eye-catching corals and tropical marine life. Many tours also schedule forays to a bird sanctuary, showcasing the diversity of Belize’s fauna. 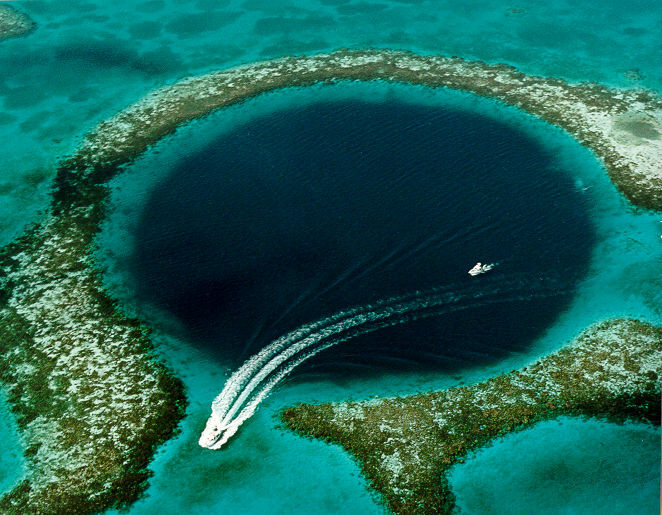 Note: Some companies do offer snorkeling at the Great Blue Hole, but it’s mainly an attraction geared towards diving. To compare prices and choose the guided tour that suits you best, you can contact tour operators. For a list of touring operators, click here. Whether you want a relaxing island escape, a thrilling vacation adventure, or perhaps seek to discover more about the fascinating Maya, a trip to Belize won’t disappoint.